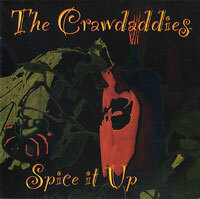 I was recently introduced to The Crawdaddies, a five man band that since 1995 has made its home in Baltimore, Maryland, USA. Their set includes an inviting mixture of Cajun, zydeco, soul, reggae, roots, and rock. All of these styles are wonderfully presented on "Spice It Up" which was preceded by their debut release: "Accordions are Cool!" -- a name that gives indication to the listener of the instrumentation that dominates every number from this CD, irrespective of style. At the start of the first number "Last Train to Clarksville" (by the way, the only cover on this recording), I can't help but think of the untimely disappearance and rebirth of the Subdudes (they are back together and busy on a new one Luc-Red). A hot guitar riff with a pumping bass above the cheerful, hopping accordion and a soulful voice immediately catch my attention, and raise high expectations as the CD progresses further. Those expectations are redeemed with listening, but the cover number stays as the main tune, which happens in the music business probably from commercial considerations. The second number is a churning reggae tune, and it feels suddenly as if it were done by a different band. But the accordion and the joyful harmony singing bring you right back. The high party value of the first numbers yields briefly to the plaintive "Baby Go". After that, the buys come back with steamy-soul/blues in "Alberta" (not a cover). And keep the party music coming with sing-a-long numbers that should keep everybody moving. "Swamp Music" is a really hot number, pleasant, sure and steady, and in a style that I would like to hear more of. Real strong harmony singing and some real fine playing by all the instrumentalists makes for a very compact and firm sound that I'd love to hear live. For in spite of my mainly vegetarian principles, I would really like a bigger taste (sample) of these guys. Send me as a spy to Baltimore.